My take on Tim’s November tag. Lots of wonderful ideas again, from THE man this month 🙂 I love the textured background he created! The background on my tag was made in similar fashion. You’ll find all his instructions at the above link. 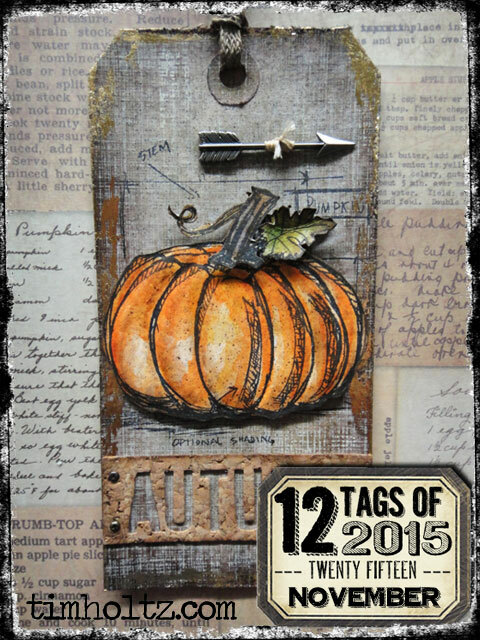 I created the background with some Distress Paint and the Weathered Textiles stamp. Next came some added color with Distress Sprays. I stamped one of the background stamps from French Marketplace and quickly rubbed it with a cloth to smudge it slightly for an aged effect. The edges of the tag were inked with Brushed Corduroy Distress Ink and then per his instructions I added some Transfer Foil. The leaf was made with Craft Core Metallic paper and the Layered Leaf set which includes an embossing folder. Added some shades of alcohol ink and also distressed it with my sanding block. Then it was scrunched up in my hand for more texture. I added a bit of the Transfer Foil to it also. For the final touches, a few stickers from his Small Talk collection and a bit of his Linen Ribbon. Not totally satisfied with my picture. One of these days, I’m going to take a photography class! Your tag is gorgeous Lee-Anne. I thought your leaf was the real deal until I read your description. All your layers and details are amazing. TFS your description too mf. The The blue makes this leaf just pop!!! SO SO SO STUNNING!!! Definitely a favorite! Awesome take! 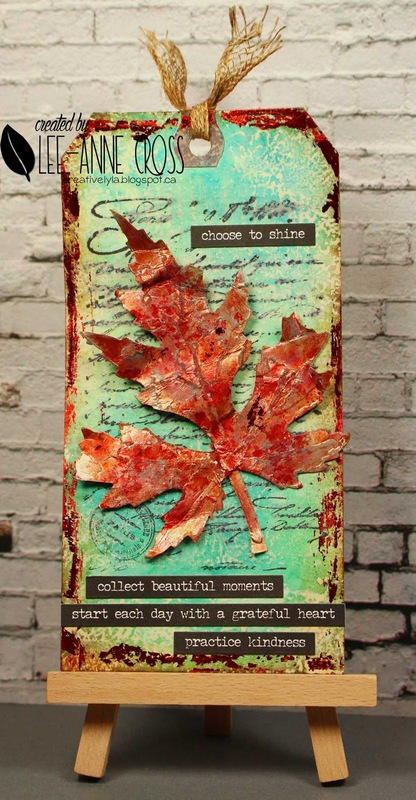 Lovely to see a non-Christmas tag for our Happy Little Stampers challenge – a beautiful leaf on a fabulous tag. Thanks for joining us at Happy Little Stampers. I really love your take! Amazing colors and love the leaf! Well done!